In this use case we will go through the steps needed to integrate CRM events with your Outlook 365. In this scenario a new event in Siebel is automatically synchronized with your Outlook 365. In other words, when an event is created in your CRM, Adeptia will create a Calendar Event in your Outlook 365 email account. The first step is to configure an Office 365 “native” application in your Microsoft Azure Active Directory. Refer to the attached document that goes through the steps of configuring a new application in Azure and generating the Client Key and Secret Key that are needed by Adeptia to connect with your Outlook 365. Clicking on Test Connection in the DB Info screen will open up a login screen that would prompt you to login to your Outlook 365 account. After logging into the account, Adeptia would automatically get the Oauth access to connect to Outlook 365. After creating the DB Info service, you can now create a Database Schema, select the Event table and map the following fields in the Event table as part of your process flow. 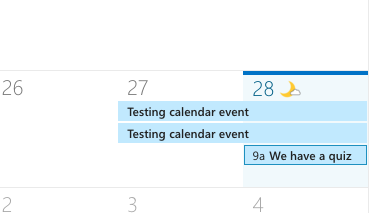 Populating the following fields listed below will create a new Calendar Event in Outlook 365. Refer to the sample deployable process flow and the Azure Active Directory configuration instructions.